@dragonlove That is exactly what happened to me on the Weather Machine. I left with nothing because of it. I have finished this with only Brave, I am satisfied with that. Ok. This is harder than I expected. I am going to buy the final piece of Brave and end there. @dragonista It is but I like them both. I have 1 Piece for Iceling Now and I’m near the 2nd. The Quest could help me. I have made a route which will get me Iceling, Brave and Arctic. The prices don’t look to extreme. I hope I don’t get Dark Dragon or King Dragon or any other breedable. I want Deathly or Cheerful Most. There is a 7 Day Streak on my calendar with an egg shaped chest with the rare icon on it as the final reward. Does anyone know what it is? 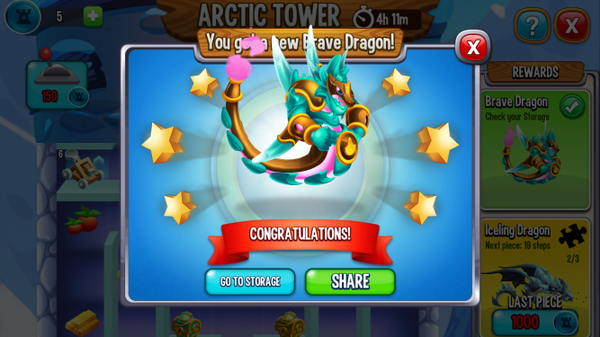 My guess is a random free rare dragon. I’m just going round and round in circles around the start. I have claimed the 100k food now. I want to reach Bunny Dragon but that’s 185. It might not be hard.